We awoke this morning to bright sun, and warm temperatures - a true chamber of commerce day. 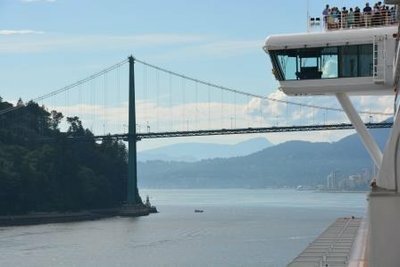 The ships in today include the Holland America Zuiderdam and our own Sapphire Princess - both are heading northbound to Alaska. After a leisurely breakfast and stroll outside we stayed in our room until checkout time of noon. Then we headed down the hotel elevator to check out, and then boarded the convention center elevator down to the cruise terminal. 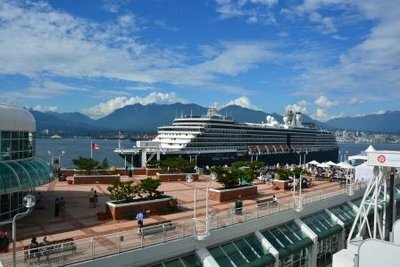 This is the one great thing about the Pan Pacific - you can walk to your cruise ship! We dropped our bags off, went through security and then went through US customs as is typical in many cities of Canada - more effective that keeping folks in Ketchikan for clearing US Customs. We got upgraded to Penthouse Suite (at a reasonable additional cost) and so spent the afternoon on the balcony, taking a nap and enjoying the cabin. One of the benefits of the suite is they comp you the first night dinner in one of the two specialty restaurants - Sabatini's or the Steak House. We chose Sabatini's and had a wonderful dinner including fried calamari and a grilled veal chop. 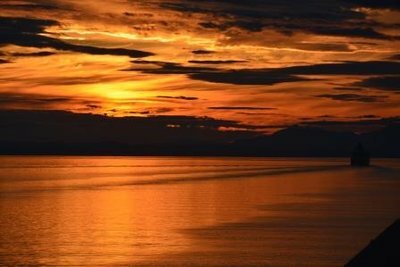 Then a stroll around the ship and back to the cabin for viewing the sunset at about 9:30pm. 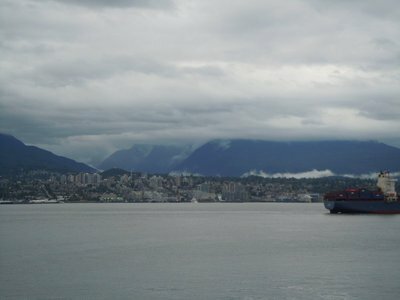 It's a cloudy day in Vancouver, but no rain - a good thing. 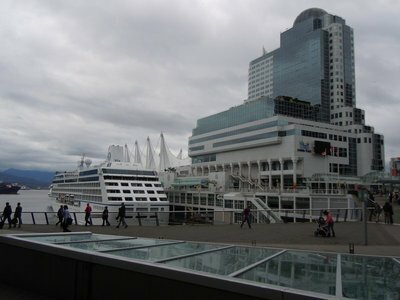 We are staying at the Pan Pacific, which is the hotel associated with Canada Place - the east convention center and the cruise terminal. It is a five star hotel and very nice with excellent service and a very comfortable room. 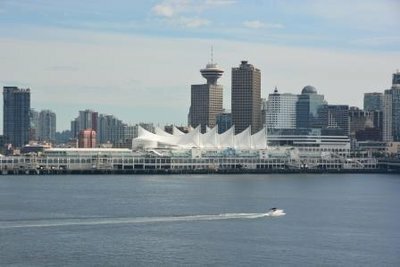 The prices in Vancouver are very high - NYC level. The breakfast buffet is $30.00 - nice with good selection but expensive. They have a five star restaurant - the Five Sails - which I ate at on Wednesday night. Did a pris fixe menu with a wine pairing - superb food and service although I ate at the bar because all the tables were booked. 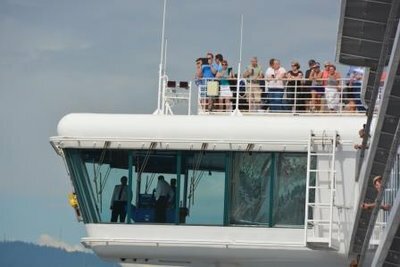 Two cruise ships in yesterday - Oceania Regatta and Silver Sea's Silver Shadow and two ships in today - Holland America's Amsterdam and Royal Caribbean's Radiance of the Seas. We board the Sapphire Princess tomorrow. I have a bunch of clients getting off as we get on. It's fun sitting outside as we can hear/see the take off of a variety of small sea planes as they head over to Victoria most likely. 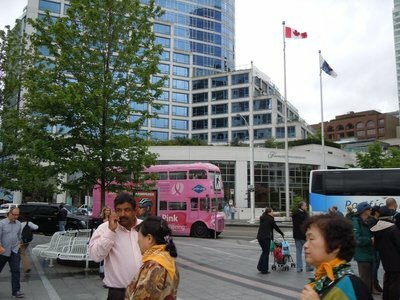 Victoria, the Empress Hotel with Tea, and Butchart Gardens are on my list - just have to fit it in sometime. On the way to Alaska! I'm back with internet access this time! 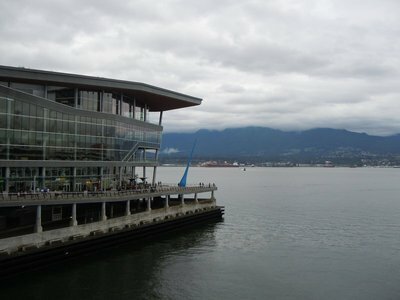 I am currently in Vancouver attending the 98th Kiwanis International Convention. For those of you who are not familiar with Kiwanis - no we are not Rotary - we are a global organization of volunteer dedicated to changing the world one child and one community at a time. We do world wide service projects - most recently in conjunction with UNICEF. With our last project, we eliminated Iodine Deficiency Disorder - the leading cause of infant mental retardation - from the face of the planet - it doesn't exist anymore. The cost was $0.05 cents per child to iodize salt in the third world. We are now in the process of raising $110M to rid the planet of Maternal/Neonatal Tetanus. Tetanus is a horrible death for young children. It exists naturally in the earth. A simple series of three shots for mothers of child bearing age eliminates the disease. It costs about $1.85 to immunize young mothers - again in third world countries. Children should not die a painful and preventable death. Stay tuned - I leave for Alaska on Sapphire Princess on Saturday!